The popular Nokia music phone, Nokia N91 has been developed further to create the perfect music companion in the form of the sleek looking Nokia N91 8GB Music Edition. The N91 8GB is similar to the Nokia N91 in design, looks & features but this N91 8GB comes with a larger amount of memory for music storage & with enhanced music focused features. This will make sure music lover can enjoy more song in one device and the other entertainment. The phone comes with 8 Gigabytes of hard disk memory which allows the user to store approximately 6000 (eAAC format) or 4000(MP3 or WMA format) songs on their N91 8GB Music Edition. The handset comes in a stylish black coloured casing which provides the user with a high quality finished handset. The user can listen to their songs using the high quality headset complete with a headset remote control. The phone comes with easy to access dedicated music control & keys which allows the user to access their music quickly. The music can be control by headset control ar the front cover shortcut music key. The N91 8GB Music Edition comes with a built in stereo FM radio with visual radio feature, just like the Nokia N91 made it perfect for music lover. 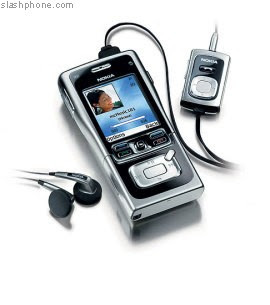 The N91 8GB Music edition is a member of the Nokia N Series Music Edition which includes the Nokia N70 Music Edition & the Nokia N73 Music Edition while other Nokia music phone such as Nokia 3250 Xpressmusic and Nokia 5300 Xpressmusic as part of Nokia music phone. The Music Edition handsets will be popular with all the music loving users who enjoy music on the go. The built in music player allows the user to enjoy a top quality music experience as it comes with an amasing stereo sound. The music player comes with many useable features which include a music mixer, loudness control, 5 band equalizer, music dynamic range compression, volume control, playback button & a play list management feature which allows the user to add new music tunes or edit existing play lists. The music player can play music in many formats which include MP3, WMA, AAC, AAC+, eAAC+, Real, WAV, M4A, AMR-WB, True Tones & AMR-NB. The user can very easily move music between their computer & N91 by simply dragging & dropping between the two devices. The phone allows the user to answer incoming calls whilst they are listening to music as the music will pause for an incoming call & after the call is complete the music will restart from where it was paused. The phone comes with up to 4 Gbytes of internal dynamic memory which allows the user to save up to three thousand music tunes. The sound experience can be heard through the headset, the integrated speakers or the user can connect the N91 to their home stereo system. The N91 comes with an integrated 2 megapixel camera complete with 6 x digital zoom which is prefect for capturing all pictures nad images of those special memories. The camera comes with different camera modes which include still, burst, video & a night mode. The user can adjust the brightness of each photo & select from different image quality settings. The phone comes with a video playback feature which allows them to playback downloaded, streamed & recorded video clips and can play video format like Mpeg, 3gpp and MP4 format. The phone comes with built in 3G technology & WLAN which provides the user with a fast & impressive connectivity. 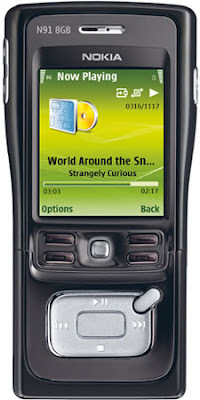 The N91 allows the user to synchronise their contacts, calendar & music files to a compatible computer by using compatible connection & even with the use of Bluetooth technology which allows a wireless connection when transferring data. The user can use Bluetooth to send & receive photos, video clips & images to any Bluetooth compatible device. The user can enjoy a good Internet experience with the help of the XHTML Internet browser which allows the user to view web sites very easily. The phone comes with voice features which include voice dialling, voice commands & a voice recorder which makes using the N91 a little more fun & a little easier. The conference call feature allows the user to take part in a call with more than one contact at the same time. The integrated handfree speaker allows the user to talk freely over a speaker when their hands are needed for a different task. Enjoy your mini Hi-Fi on the hand with N91 !